Buick is an upscale vehicle marque of General Motors (GM).The Company was Founded by Scottish born David Dunbar Buick in 1899 the establishment combined with the Buick Motor Company on May 19, 1903. Buick models are sold in the United States, Canada, Mexico, China, and Israel. Buick holds the distinction as the oldest active American make. Buick models share some architecture with other GM brands. As part of Buick’s history comes a long list of celebrity and athlete endorsers. 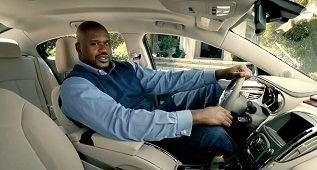 Some of the stars who have worked with Buick include: Tiger Woods, Peyton Manning, Marissa Miller and Shaq. Shaq’s endorsement underlines the stylish nature of the LaCrosse, and remind viewers that a big sedan doesn’t have to be inefficient. The LaCrosse eAssist is powered by a 2.4 liter mild-hybrid engine that gets 36 MPG on the highway. Buick’s other spots feature Peyton Manning, who demonstrates the infotainment and safety technology in the Buick Verano, and supermodel Marissa Miller accentuating the luxurious and modern styling of the Enclave. All ads call attention to Experience Buick — the brand’s 24-month leasing program that combines the lease payment, scheduled maintenance visits, OnStar, and SiriuxXM satellite radio into a single monthly payment. As the leading athlete booking agency, Athlete Promotions can help you secure one of your favorite athletes to promote your company’s products or services. By calling our agents at 888-246-7141 or just by filling out this online athlete endorsement form, let us assist you in taking your company to the top today.